You are looking at the most popular picture I’ve ever posted on Instagram. 123 people liked it (so far). Amanda Hesser liked it, The Pioneer Woman liked it. It’s the same yogurt parfait I’ve been making for a while–granola, yogurt, fruit–only one thing was different: I served it in Mason jars. Suddenly something that’s not too exciting became exciting, if also a bit “hipstertastic” (to quote The Wannabe Chef who wrote that on Twitter). But if serving a granola, yogurt, and peach parfait in a Mason jar makes me a hipster, then crank up the Vampire Weekend and ship me to Williamsburg. Preferably in a Mason jar. 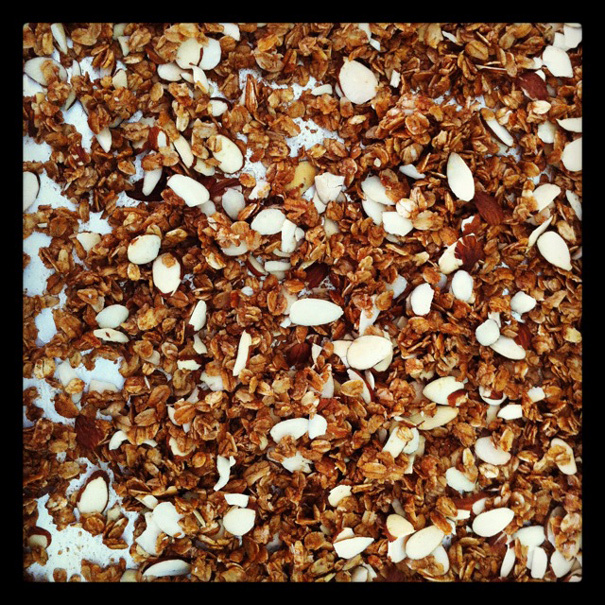 The granola comes from this recipe, taken from the Baked book. The yogurt was gussied up a bit with a squeeze of orange (from the tree outside our front door) and a splash of vanilla extract, stirred together (based on a notion from The Barefoot Contessa). 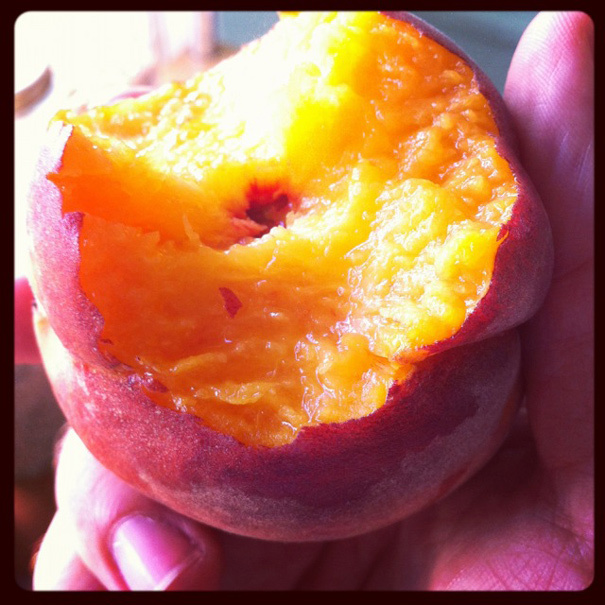 The peach came from the West Hollywood farmer’s market and it’s one of the best peaches I’ve ever had. I ate a bunch of them during the week, this was the last remaining one. 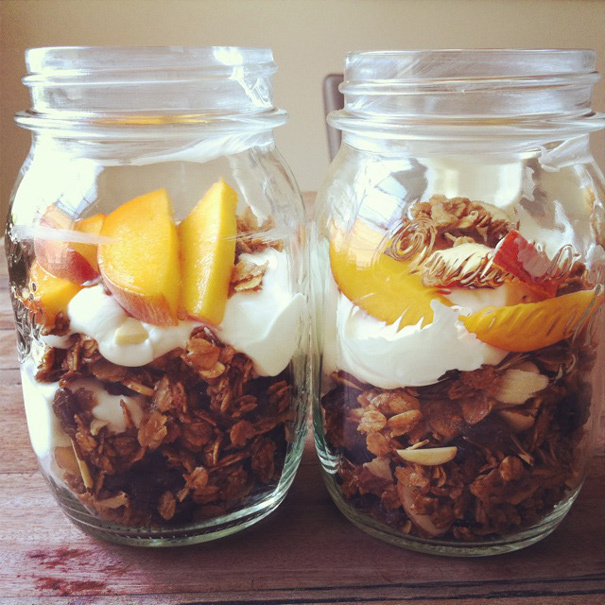 To assemble the parfait, I put a little granola at the bottom of each jar, spooned on some yogurt, some pieces of peach, some more granola, some more yogurt, some more peach, and, finally, a little granola on top. It’s a lovely presentation and it would work with any kind of granola and any kind of fruit; but the better the fruit and the better the granola, the better the parfait. So put on your hipster hat and your skinny jeans and get thee to Bed, Bath, and Beyond which, come to think of it, isn’t a very hipsterish store but they have a good deal on Mason jars. Pretty soon you’ll be modeling for American Apparel and touring with Jonsi, but for now: enjoy your parfait.